content generation. Use a firm that understands the impact of SEO and how it can be utilized in all areas of online activities. Focus the content – make sure your marketing partner clearly understands the message that you wish to convey as part of your marketing plan. The message should be consistently applied in all content generation activities. Know the target audience – all content that is produced should be centered around your business target audience. By utilizing the target persona you can better tailor content that will attract qualified leads that will more easily convert into sales. Use all online channels – once you assess your target audience you should have a good idea on what online channels should be leveraged for your content. Focus the bulk of efforts on channels where your target market is most likely to frequent. This can include your web site, email newsletters, social media such as Facebook or LinkedIn, and even trade web sites. Consider the tone – the style and tone of your online content will say as much about your company as the words themselves. A lighthearted jovial tone could work well for a family focused business, while that same tone may not work well for a law firm. Review carefully your company culture and approach to customers to make sure the tone of your online content properly conveys your company’s personality. 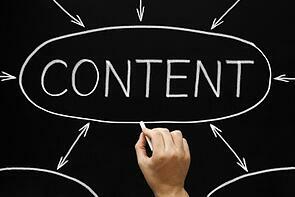 An experienced marketing firm can help in building an online content portfolio that will work well for your company. For more information please call us directly or click the button below and we will contact you. Thank you.